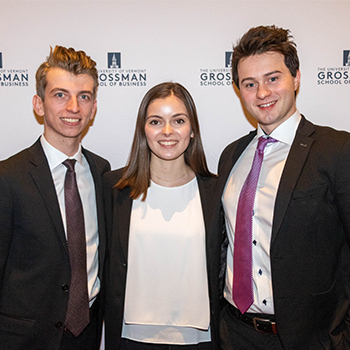 This January, a team of undergraduate business students from the Lazaridis School travelled to the University of Vermont to participate in the Grossman School of Business’ 6th Annual Global Family Enterprise Case Competition (FECC 2019). Competing as one of 13 undergraduate teams from six countries, Josh Kravitz (BBA, Finance & Economics), Sloane Keilty (BBA, International Business), and Quinn Robinson (BBA, Finance & Economics) travelled with John Young to represent the Lazaridis School at the competition. The FECC team is selected by invitation to participate in the competition, which includes weeks of preparation, reading, case analysis and practice presentations on top of their studies. Family Enterprise cases bring in another layer of complexity to the business model as students must also consider interpersonal conflict or competing family preferences while making their recommendations. The Lazaridis School has participated in FECC for the past five years, reaching the final four times and winning ‘Best Presenter’ awards four times. This year, team Laurier reached the finals and took 4th place overall, after an exciting 1st place win in their division.